I like it just as is but you can adapt to include nuts, chocolate or whatever you like to pair up with caramel. It involves creaming butter, sugar, eggs and vanilla. Flour, baking soda, and salt is mixed in and some of this mixture is baked into a baking pan for a few minutes. 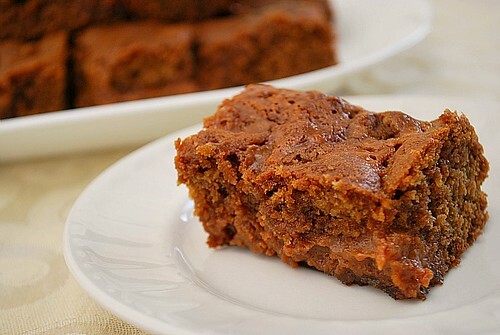 Meanwhile, caramel is melted with some evaporated milk and poured onto the baked bars. Dollops of the remaining batter is swirled into the caramel layer and is finished baking. The result is a decadent dessert bar that's buttery and sweet. If you do want to adapt the recipe, I recommend adding the extra ingredients over the caramel layer and swirling it in with the remaining batter. Meanwhile, melt caramels with evaporated milk in nonstick saucepan over very low heat. Pour remaining caramel mixture over baked bottom layer. Drop tablespoonfuls of remaining batter over caramel layer; swirl slightly with knife. Bake 15-20 minutes or until golden brown. Cool completely in pan on wire rack. Cut into squares. These look absolutely devine! I love dulche de leche!! Thanks! These look delish! Seems to be one of the hot new flavors. Thanks for sharing. I can't wait to make these - I might have to carve out some time this weekend! Do you think cut up apples would go well with this recipe? These look delicious, I am a dulce de leche lover so am sure to love these, thanks for the recipe!